In this review we want to give you a little extra insight into the Milwaukee Motorcycle Clothing Company Maverick jacket. We will cover its features and we will tell you what is good and bad about this leather riding jacket. In the spirit of fairness, we will try to cover everything this jacket offers from a positive and negative side. When it comes to motorcycle jackets and the materials that they are made from, very few things can compete with good classic leather. Not only does leather look great, it offers breathability and excellent abrasion protection. But with so many options available it can be quite a task to research the jacket that will give you the top of the line protection, style and price that suits you best. That way you can make an easy choice if you need to weigh up where your cash is going and how much protection you want while riding. Why Should I Choose The Milwaukee Maverick? The Maverick is a genuine leather jacket made in Pakistan. It comes with a removable quilted liner and two inside chest pockets for your valuables. The Maverick Jacket has zippered cuffs on the sleeves and a ribbed waistband. This vintage looking riding jacket is available in a classic black dyed leather of high quality. It has zippered vents and two outer pockets to warm your hands. It has a comfortable fit and is made with heavy leather for the serious rider. But let us take a look at the pros and cons of this jacket so we can decide if it really does what it promises. The Milwaukee motorcycle company has made an excellent jacket with the Maverick. It is made from quality leather and is a good heavy jacket that will offer excellent abrasion protection from all the different obstacles the open road throws your way. The stitching and zippers are well made and of high quality. Not only is it well-made but it also looks good. It has a tailored fit that fits snugly but the leather is also supple. The pockets are well positioned and come with a good number of vents, which also have heavy duty zippers. It will not bind or bunch when you ride. It also has spandex inserts that allow for even more comfortable movement. The jacket will keep you nice and warm on colder days and if you buy a slightly larger size you can add additional thermal layers for colder weather riding. Just keep in mind that the sizes run a bit large anyway. Another positive is its price, leather is expensive but you will be hard-pressed to find a jacket of this quality in leather, and at this price anywhere else. If you are on a budget but don’t want to go for textile this Maverick is a rock-solid option. On the negative side, there is not a lot to say about the Milwaukee Maverick jacket. Some of the complaints are that the leather smells a bit initially, which can be kind of annoying when you first bring it home. Though the smell does tend to dissipate within a week or so. The leather is treated with chemicals during the dying and tanning process and these tend to have a bit of a smell after the jacket is made. There is no closure for the outer hand warming pockets which can be a bit annoying and it does not have any body armor or pockets for additional elbow or shoulder armor. It will have good abrasion protection but it does not have additional reinforcing like some mesh or textile jackets. The quilted liner is also not incredibly soft. This might be a problem but you can easily remove the liner as well. The cuff zippers don’t allow for much adjustment and this can still let some air in on colder days. Other than these points though, the jacket performs really well. If you’re looking for another rock solid option, check out this classic motorcycle jacket from hot leathers. 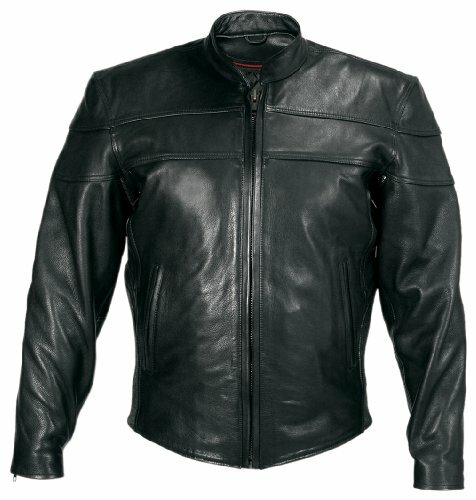 If you are in the market for a good quality leather riding jacket, this Milwaukee motorcycle clothing company Maverick jacket will suit you well. The Maverick has all the features you want from a leather riding jacket. The Maverick Milwaukee jacket is reasonably priced and you will have a hard time getting a jacket of the same quality in this price range. It will give you many years of good service and offers good looks and versatility to boot. It has high-quality zippers and stitching, it is a good heavy jacket for your protection and it has a good number of functional pockets. The Milwaukee Maverick Jacket also has vents on the sides and under the arms to keep you cool in warmer areas. We can really recommend the Milwaukee Motorcycle Clothing Company Maverick Jacket if you are looking for classic leather style and protection. We hope that this review has given you the information you need. Make sure to always look good, get comfortable and most importantly, be safe!